Leonard Perlmutter is the founder of the American Meditation Institute for Yoga Science and Philosophy in Averill Park, New York. He currently serves as Spiritual Director of the Institute. Mr. Perlmutter is the author and editor of the quarterly publication “Transformation” The Journal of Meditation as Mind/Body Medicine. His first book, “The Heart and Science of Yoga: A Blueprint for Peace, Happiness and Freedom from Fear” received six major book of the year accolades including the prestigious ForeWord magazine, Benjamin Franklin, Eric Hoffer, Nautilus and Independent Publishers Association awards. 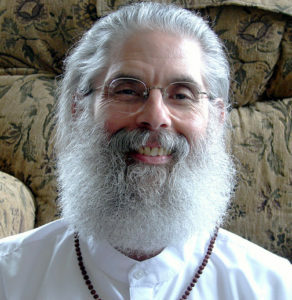 Over the past forty years, Leonard has served on the faculties of the New England Institute of Ayurvedic Medicine in Boston, Massachusetts and the International Himalayan Yoga Teachers Association in Calgary, Canada. He has studied in Rishikesh, India and is a direct disciple of Swami Rama of the Himalayas––the man who, in laboratory conditions at the Menninger Institute, demonstrated that blood pressure, heart rate and the autonomic nervous system can be voluntarily controlled. These research demonstrations have been one of the major cornerstones of the mind/body movement. During the past several years, Leonard has presented informative workshops on the benefits of Yoga Science at the M.D. Anderson Cancer Center, The New York Times forum on Yoga Science, the Commonwealth Club of California, the University of Wisconsin School of Nursing, the Washington University Medical School and the University of Colorado Medical School. Since 2009, Leonard’s Heart and Science of Yoga® empowering self-care program has been certified for continuing medical education credit by the American Medical Association and the American Nurses Association. In 2014, Leonard’s 5 1/2 hour online video course, Comprehensive Meditation and Easy-Gentle Yoga, was released. It contains the core Heart and Science of Yoga® curriculum. His many writings and all his seminars are enlivened by his inspiring enthusiasm, vast experience, humor and clear teaching style. Leonard is a graduate of the American University with degrees in Political Science and International Relations, and attended the George Washington University School of Law.